Mangaluru, April 29, 2018 (DC): The BJP may have its supporters and the RSS campaigning for it along the coast, but it may have to contend with progressive thinkers, who are holding “awareness programmes” to advise people against voting for it in the assembly poll. 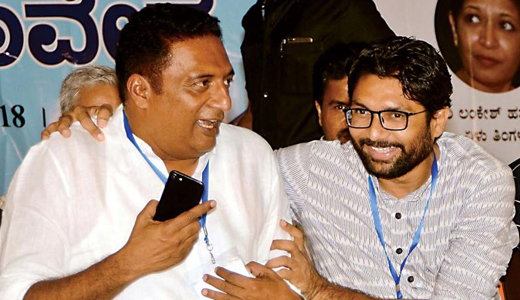 The ’Swabhimani Samavesha,’ held in Bantwal and Ullal in Dakshina Kannada district on Saturday saw progressive thinkers like actor Prakash Raj, former students union president of Allahabad University, Richa Singh and Vadgam MLA, Jignesh Mevani appeal to the people to keep the BJP out of power in Karnataka. 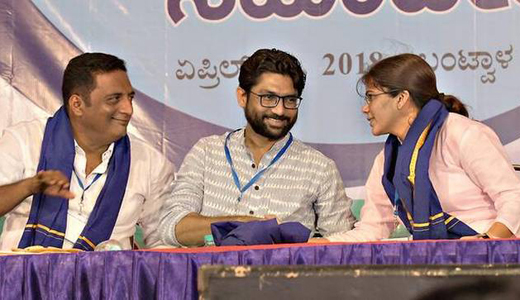 In his address, Mr Mevani challenged Prime Minister Narendra Modi to an open debate and declared he would give details about the corrupt practices of the BJP in Gujarat during its 22 year rule there. He urged the people of Dakshina Kannada to question Mr Modi on his failure to provide the assured two crore jobs and on the ordinance against the Supreme Court ruling on the SC/ST Act. He said: “When Modi comes to campaign in Mangaluru (on May 8), do not send him back empty-handed. If he does not give reasons for not generating jobs, ask him to go back.” Mr. Mevani claimed that Mr. Modi had not generated even 1% of the eight crore jobs that should have been generated in the past four years of BJP governance. "There can be differences and arguments. But how can they attack me on my personal life? There is a limit for everything," he added.